Christina Rice of the Wellness Realness Podcast joins us today to discuss how nutrition and relationships helped her overcome anxiety and depression. Listen in and hear her and Ben discuss how you can live a great life by treating your body well and cutting out negativity. They discuss parenting, nutrition, relationships and much more in this great, casual conversation between health experts. This episode is brought to you by Four Sigmatic Mushrooms. Upgrade your health and live your greatest life with mushroom supplements. Use code Muscle for 15% off at checkout. 2:30- How Christina and Ben both approach wellness in very similar ways. 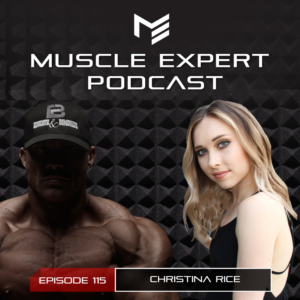 4:15- How Christina fell into fitness “bodybuilding style” and the necessity of enjoying training. 6:30- How Christina found health and fitness trying to escape anxiety and depression. 14:45- What Christina found contributed to her poor mental and physical health in high school and college. 17:00- “How’s your mind?” Chasing happiness through junk food only leads to more depression and health problems. 19:45- Health education. The problems with our modern health information. 23:00- Nutrition changes everything. How going gluten free gave Christina more energy, a clearer brain and a better life. 29:30- The importance of paying attention to your bodies signals rather than based on the advice of “health coaches”. 31:45- Real life vs marketing. How social media has “filtered” how we receive health advice. 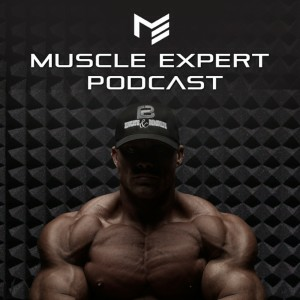 37:00- Genetics and diet. What can you learn from your genetic expressions to develop a personalized diet. 42:00- Christina’s Paleo Diet. Grass fed beef, wild salmon and organ meats! 45:00- Removing inflammatory people why you need to take control of your environment to optimize your health. 47:00- How Christina mitigates stress by going outside and being in nature as well as with essential oils. The power of breathing to calm your mind and energy. 55:30- Our deepest fear is not that we are inadequate, it is that we are actually powerful beyond measure. The feeling of inadequacy prevents people from truly living to their potential. 63:30- BPak on parenting. Become a great person to raise great kids. 67:20- Good nutrition, good people and great self. Christina’s advice to help you live your greatest life in your greatest body!